Mechanical engineers focus on the design and operation of machinery and the prediction of machine behavior in industries such as transportation, power generation, energy conversion, environmental control, materials processing and materials. Materials engineers focus on problems associated with the design of materials and materials processes to meet specific needs in a wide range of industries. Career opportunities abound with traditional manufacturers. Students also go on to graduate school or professional programs. 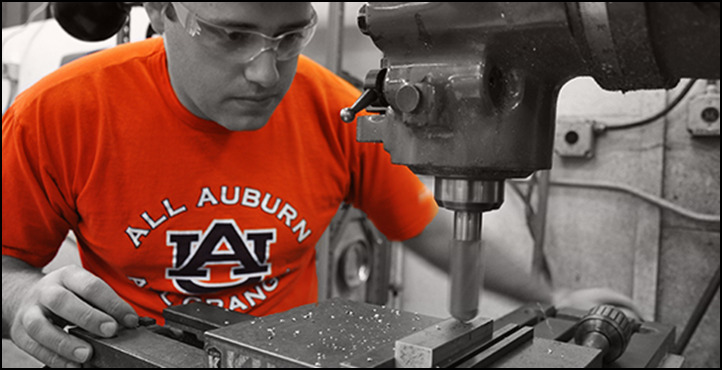 Auburn University's Department of Mechanical Engineering, established in 1885, offers two undergraduate degrees: Bachelor of Mechanical Engineering (with specializations in automotive engineering and pulp and paper engineering) and Bachelor of Materials Engineering. The department offers graduate courses leading to a Master of Science (thesis), Master of Mechanical Engineering (non-thesis,) and a Doctor of Philosophy in either mechanical or materials engineering.